CNN’s FAREED ZAKARIA GPS features an interview with Iranian President Hassan Rouhani regarding the threat posed by the Islamic State in Iraq and Syria, the P5+1 nuclear negotiations, and the harsh judgment by Islamic authorities in Iran. FAREED ZAKARIA GPS: Earlier this week, I had the opportunity to sit down with Iran’s President Hassan Rouhani. This is a critical moment for Iran’s relations with America and the world. Not only is crunch time quickly approaching in the nuclear talks, but there is also ISIS. Tehran has as much to fear from ISIS as Washington does so will it help battle the terrorists? The conversation was convened by the New America Foundation – on whose board I sit. Listen in. FAREED ZAKARIA, HOST: Thank you for joining us, Mr. President. Do you believe that the United States is correct in its strategy to fight ISIS? 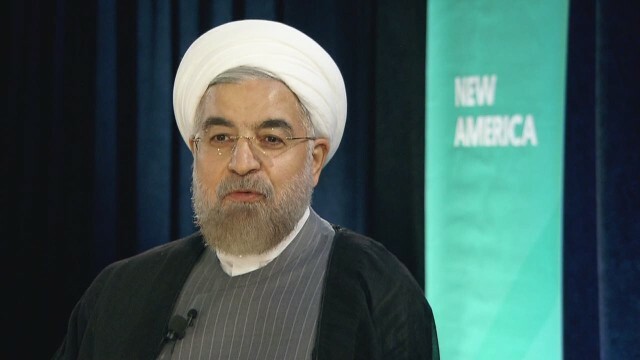 ROUHANI: (translation) I am not aware of the American plans and the formulas and what they intend to execute. I can only tell you about the plans of the Islamic Republic of Iran. Iran, from the very first moment, did not hesitate in fighting against terrorism. Other countries apparently had their doubts for quite some time. They were under the impression that, be it as it may, they acted quite late in the game. From the first day when Daash attacked Mosul and Mr. Maliki contacted me, former Prime Minister Maliki contacted me and informed me of the grave situation in Iraq, I did tell him that whatever aid and assistance you see necessary and you need, we will render that assistance and aid to you so as to help you to stand up against this tide. If immediate – if it wasn’t for the immediate and the whole-hearted help of the people of Iran to the people of Iraq, and if it were not for the fatwas issued by the religious authorities in Iraq, have no doubts that Daash today would be residing in southern Baghdad, not in the northern territory of the country. Therefore, we do believe that we did live up to our responsibilities and we will continue to do so steadfastly and others who have decided to act as well. And if those actions can lead to the eradication of terrorism, we welcome those actions. ZAKARIA: In his speech today, President Obama had a direct message to Iran. He said, “Don’t let this moment pass, we can reach a solution.” Is he right? Is the United States negotiating in good faith? ROUHANI: Well, you see, today we have a — we are faced with a very good opportunity vis-a-vis the nuclear talks and negotiations. This good opportunity was created in reality only last year. In result of the expression of the political will of the majority of the people of Iran and their vast participation in those elections and the mandates received out of those elections. A new atmosphere was created in result of all of that. We must all make good use of it, our side, as well as 5-Plus-1. Everyone together must make good use of this historic opportunity. ZAKARIA: You said something in a conversation — in the conversation you had with a group of journalists a couple of days ago which intrigued me. And I was lucky enough to be at that meeting. You said that in your phone call with President Obama last year, you had talked with him about potentially cooperating or — on a number of issues. But you said all of that waits for the nuclear issue to be resolved. Can you give us a sense, paint for us a picture of what … what life would look like between Iran and the United States if the nuclear deal was resolved? ROUHANI: Yes, during last year’s telephone conversation, we did speak of extended, pot -extended potential cooperation between Iran and the United States. President Obama was of the opinion that we can, indeed, collaborate and cooperate in various fields. And I told him that I agree with you whole-heartedly that in the future we must cooperate with one another. So let’s not compare any scenarios. Let’s first finish the path that we’ve embarked upon. Then there may be other issues, a multitude of issues important to both sides. We can cooperate on those. FAREED ZAKARIA, HOST: More now of my interview with Iran’s President Rouhani. He has been in office for just under 14 months. Those have been crucial months for changing the way the West sees and deals with Tehran. But there are still many hurdles to get over. ZAKARIA: Mr. President, let me ask you about something that has to do with the image of Iran, in the world, in America, but also among younger Iranians. And it makes it difficult for people to — perhaps to trust Iran or to feel — you know, you were talking about the atmosphere getting better. This is, I think, the kind of thing that makes the atmosphere difficult to improve. You have six Iranians, young Iranians who made this video of the song, “Happy.” They have been sentenced. They have been sentenced to lashes, which have been commuted. They have been forced to recant on television. Why — why make them go through this — this punishment for making a harmless video about a song? ROUHANI: We do have a multitude of problems, sir, in the region and the world at large today than to speak about the prosecution of certain individuals. But be that as it may, I, as the president of Iran, have been sworn and put there by the will of the people to protect the constitution. If the constitution is ever violated, it is my legal responsibility to take the appropriate steps and implement appropriate actions. But as you know, in Iran, we do have an independent judiciary. Perhaps an individual does something that legally may not be allowed in Iran, whether I like it or you like it or not. So I am not certain what this thing that you’re referring to was, how many people danced and because of that, what happened happened. I don’t think the problems are such in Iran that if a group wants to have fun somewhere, they are then arrested or become targets. ZAKARIA: You haven’t seen the video? ZAKARIA: Mr. President, I have one last question and it’s one I’ve asked you before. But please indulge me. Jason Rezaian, the correspondent for “The Washington Post” and his wife have both been arrested. Nobody knows what the charges are. Nobody knows why. Your own foreign minister has said that Jason is a good reporter. People have — have attested to you personally that he is a decent person. I know you say it’s with the judiciary and you can’t comment. My question is, I’m trying to get at this a different way. Can you give us hope that this case will be dealt with fairly, with leniency and speedily, that he — that this will be resolved quickly and that Jason will be able to come back to the United States? ROUHANI: Listen. Leniency and everything that you just went over, these are topics to be thought about or spoken of after the final judgment is rendered. And an individual who is brought up on any charges or detained or questioned, all of the different steps must be in accordance to the constitutions and the laws of the country. If that individual has not committed any crimes, it will be determined that he or she or they are innocent and they will be freed. And it will be announced openly. So we must not prematurely express opinions about a case file that hasn’t reached the court yet. Sometimes the minister for the judiciary — judicial affairs sometimes does inquire a member of my cabinet, sometimes does inquire as to the conditions of folks who are detained from time to time. ZAKARIA: Will — will you — will you make an inquiry from your office about their condition? It would, I think it would carry some weight. ROUHANI: Generally speaking, for everyone, what I said goes for everyone, not targeted towards a certain case file or a certain individual. ZAKARIA: Well, it’s — it’s my full hope and expectation that he will be released soon. Mr. President, thank you so much.